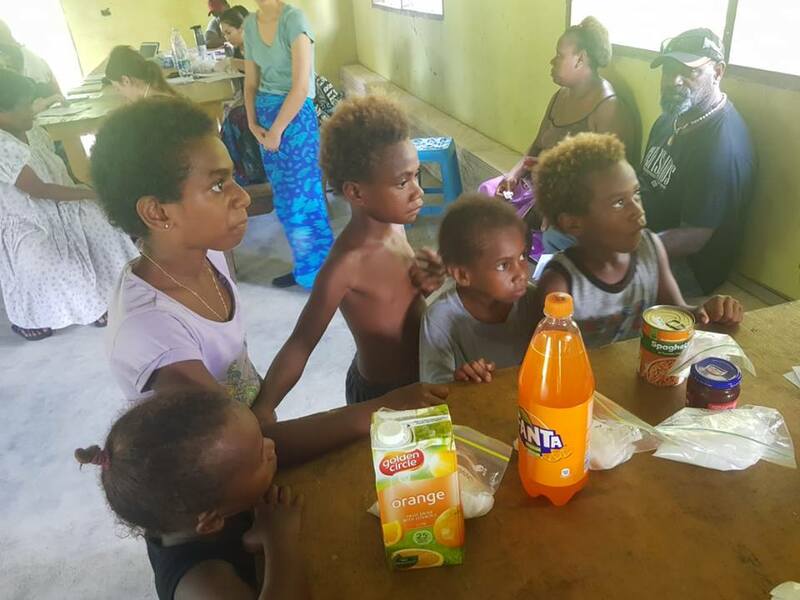 Cherry Wong, a master of public health student from the University of Melbourne wrote the following article about her experience in Vanuatu in the health outreach group program. 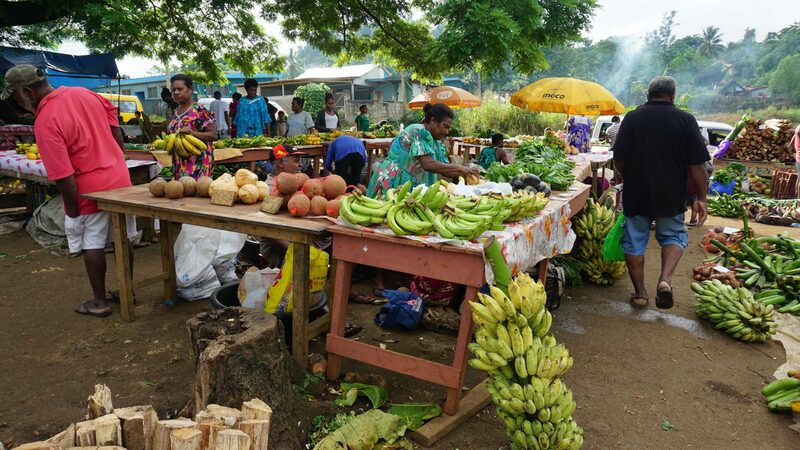 In Vanuatu, the majority of deaths are caused by non-communicable diseases (NCDs), which can be prevented. In particular, the prevalence of diabetes ranks sixth globally. The aim of the outreach project is health promotion and free assessments about nutrition and healthy lifestyle in the prevention of diabetes and development of other NCDs. 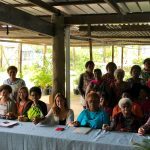 At the start of the project, we were given a taste of culture through a Bislama language lesson from the locals, visits to various villages and walking tours to places including the local fruit market. We took the opportunity to observe local consumers’ behavior and choose the most popular items among the supermarket. Our project coordinator eventually bought the frequently purchased products as our sugar education props. 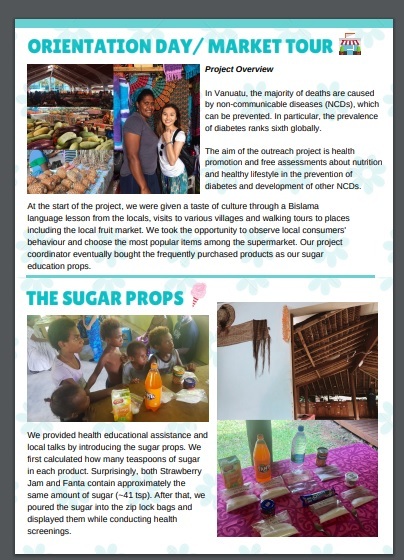 We provided health educational assistance and local talks by introducing the sugar props. We first calculated how many teaspoons of sugar in each product. Surprisingly, both Strawberry Jam and Fanta contain approximately the same amount of sugar (~41 tsp). After that, we poured the sugar into the zip lock bags and displayed them while conducting health screenings. 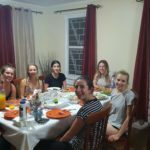 Our team consists of a wide range of health professionals and I must proudly say that I have absorbed a lot of new knowledge that I would have never expected. 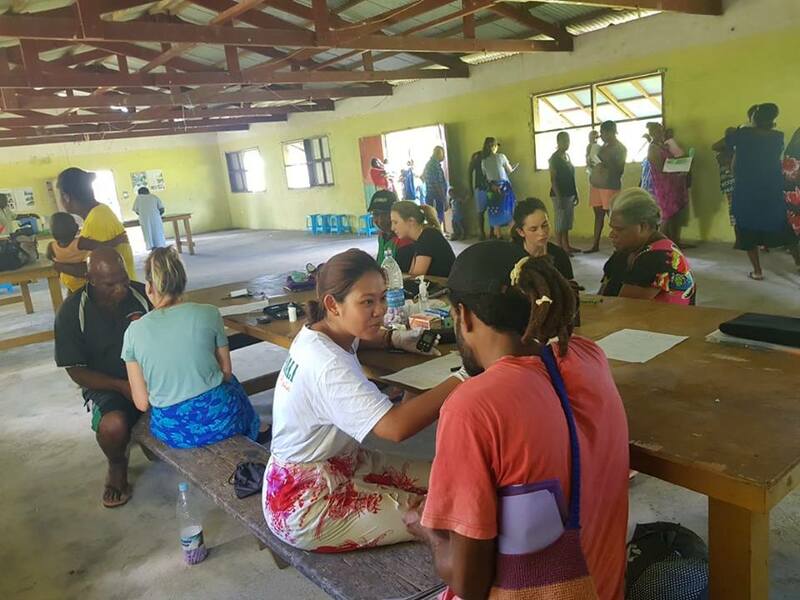 I’m amazed by how quickly we have formed an inseparable bond within the team and we even came up with a name “VANUA-TEERS”, which is a combination of Vanuatu and Volunteers. 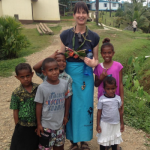 In Vanuatu, there are significant disparities in regards to regular access to health care. This involves travelling far from home to the health clinics and hospitals, lack of financial resources or inadequate communication services. The dress code in Vanuatu is quite conservative, therefore we must wear sarongs during our health check visits. 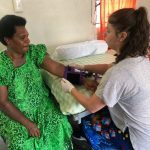 Throughout the whole two week visit, we conducted 412 free health assessments in total, including waist to hip ratios measurement, blood pressure checks and blood glucose level tests, at the local community hall, health clinic and even the household. 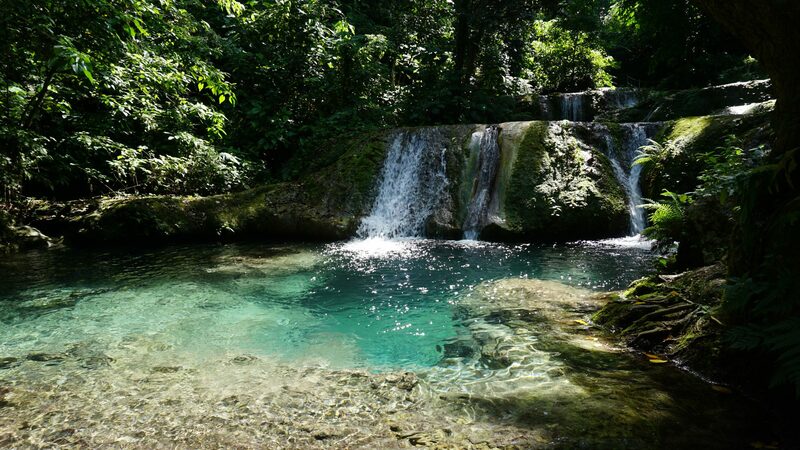 phenomenal fire dance, go on a hike to the cascade… HONESTLY! UNFORGETTABLE! 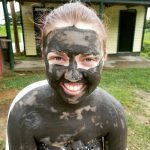 For many of you, you may have little knowledge or not even heard of Vanuatu before. Though it is not a well-known country, I have personally come across it several times in high school when TV ads in Hong Kong occasionally popped up encouraging immigration to Vanuatu. after knowing the small acts of kindness can bring significant joy to people’s life. 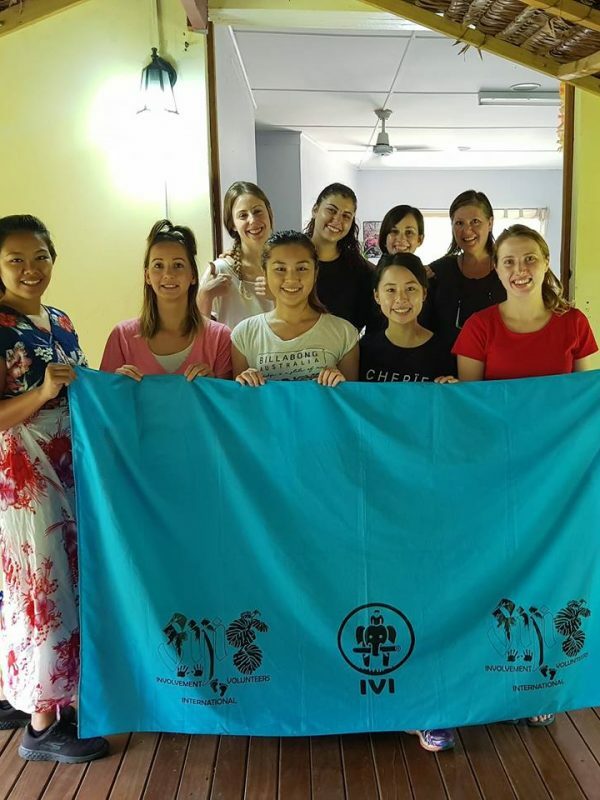 Last but not least, I would like to thank deeply our coordinator from Involvement Volunteers International (IVI), Carrun and the local coordinators Lynne and Meriam for making this trip exceptionally smooth, enjoyable and memorable. I truly hope the trust-building work we did in this community will continue to flourish.